Now you can play it on PC, but will you want to? Fallout Shelter has enjoyed a special place in my heart—or at least on my tablet—for much of the past year. Originally released as a teaser of sorts for Fallout 4, it was a great way to whet my appetite for exploring the wastes. You're in control of a new vault, building new rooms, changing the layout, upgrading your vault dwellers and their equipment, and sending people out scavenging in the wasteland. I've played Fallout Shelter a lot—and by that I mean I've pretty much maxed out my vault on my Android tablet (an Nvidia Shield, if you're wondering). I have the maximum allowed 200 vault dwellers, plus six extras waiting outside (never mind the 10 dwellers I evicted when I wanted to add Old Man Longfellow when he showed up to coincide with the Far Harbor launch). Everyone is at level 50 with max stats, and they all have legendary weapons. No cheating was involved, and I haven't spent a single penny. Months of playing 15-20 minutes daily adds up, but you do reach the point where the gameplay runs thin. With the release of the PC version, I've started a new vault to see if Bethesda's additions and a PC control scheme make it worth building back up from nothing. Many hours of playing Fallout Shelter on a tablet. As you might expect, the experience on a PC is both similar and strikingly different than using a tablet. (I never tried Shelter on a smartphone, due to the cramped screen size.) You can use a touchscreen display for some things, but pinch-to-zoom isn't supported, which is a pretty significant omission. The mouse does work fine, though, with the scroll wheel zooming in and out. Using a mouse instead of a touchscreen doesn't quite have the same feel, but on a larger display I imagine lifting my arm would get tiresome. The PC version supports hotkeys (e.g. press 'B' for build, 'Esc' to exit most menus, etc. ), but this isn't a fast-paced real-time strategy game so the hotkeys are welcome but not necessary. The graphics also use what was classified as 'HD zoom' on Android, where the 3D environment is fully rendered even when zoomed out. Of course, there are times where the flat perspective is easier to deal with (like finding the Mysterious Stranger), but that's a minor point. Overseer's Office: a new room that allows you to send vault dwellers on quests; can be upgraded to allow two or three concurrent quests. Questing: send groups of up to three vault dwellers on quests—see below. Nuka-Cola Quantum: used to boost (immediately finish) crafting as well as traveling to/from quest locations and returning from the wasteland; can also be used to skip extra objectives (beyond the normal one skip per day limit). Radscorpions and Ghouls: two new monsters that deal radiation damage as well as physical damage; RadAway is now used far more often than before. While the new monsters and Nuka-Cola Quantum are somewhat interesting, it's the addition of questing that really shakes things up. The Overseer's Office has a list of at least three potential quests, including one daily quest. The rewards involve the usual new equipment, junk, and/or blueprints, along with some that give you more Nuka-Cola Quantum, recruits, and perhaps other stuff. Quests require travel time, similar to wasteland exploration (return time is half the original travel time), but there's no random encounters along the way. Instead, you send a team to the destination, and once there you have to do some actual micro-managing of your team. Exploring a location involves tapping/clicking your way through the various rooms, many of which will have combat as well as item caches. Combat is handled quite differently in quests. You can see health bars for your dwellers as well as the monsters, and each creature now targets one other creature. You can specify a target for each dweller (though this can be a bit finicky), and area of effect weapons (missile launcher and fat man variations) damage all the enemies in the room. That last point means it's almost always best to equip everyone with AOE weapons (assuming you have them), but some quests have armor/weapon restrictions that you'll have to take into account. 'Boss' monsters are a new addition. The updates and addition of questing definitely help to make Fallout Shelter a better game, but there's still a clear lack of depth. If you've already started playing the game on a mobile device, there's also one massive caveat with the PC version: you can't transfer your progress from iOS or Android to the Windows version (you can't transfer between iOS and Android either). So on PC, you're pretty much required to start from scratch. Yuck. Hopefully Bethesda chooses to address this with an update, though the FAQ does suggest they plan to keep the OSes separate. (It's also interesting that the Android version of Fallout Shelter is 194MB while the Windows version is 1.2GB, though it's not clear if that's due to improved graphics and audio or some other change.) PCs do have the advantage of being more powerful, and while the game runs fine on my Shield tablet, load times—which now occur every time you enter and leave a quest location—are 25-45 seconds when you have a larger vault. On a PC, the transitions happen noticeably faster; even on a moderate 3-year-old laptop areas load in 5-10 seconds. Right now, the only way for me to play my existing Android shelter on PC is through an emulator. UPDATE: Some readers have mentioned in the comments that you can manually copy your save file off an Android device and onto your PC. That's great news, though it would have been far more useful for Bethesda to just use their 'cloud save' feature. I've featured the comment with the instructions below. Fallout Shelter running on PC via BlueStacks. Fallout Shelter running on PC via AMI DuOS. Bluestacks, seen above, runs the Android version fine, though the graphics look more pixelated on my laptop and load times aren't really any faster than my tablet. AMI's DuOS is another option that works better in my experience, though that requires a $10 purchase if you want to use it long-term and it basically requires a touchscreen to work well (the mousewheel doesn't zoom in/out). 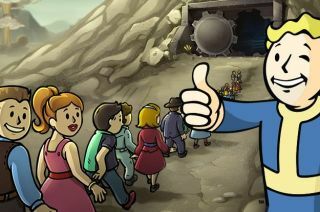 Besides the fact that anyone who really wanted to play Fallout Shelter on PC has been able to do so via other means for a long time, the biggest issue with Fallout Shelter on PC is that most PC gamers have a lot of other more compelling games available. As a strategy game, you won't find the depth here that you can find in building management sims like Prison Architect and RimWorld, which also don't have microtransactions built into their design. Having invested 150+ hours into the Android game, switching to PC makes me want far more depth than what Fallout Shelter offers. It's a fun diversion, but it's mostly a diversion I've played with when I'm away from my PC. If you've never tried the game on mobile devices, it might hold your interest for a bit, but like many F2P games with micro-transactions, there's a lot of waiting involved. Personally, I'd rather be playing Fallout 4, but at least this one is free.